You won’t taste it in the final result, but puréed cooked beetroot adds fantastic moisture and a deep purple tinge to these simple red velvet-style cupcakes. 1. Preheat the oven to 190°C, gas mark 5 and line a 12-hole muffin tin with paper cases. Sift the flour, cocoa and baking powder into a large bowl with a pinch of salt, then add the sugar and run your fingers through the mix to find and squash any lumps. Make a well in the middle. 2. Put the beetroot into a blender or food processor with the milk. Blend until smooth and thick. Pour the beetroot, melted butter and beaten eggs into the dry ingredients then beat together with a spatula to make an even, fairly thin batter. 3. Divide the batter between the cases then bake for 20 minutes or until risen and shiny, and a skewer inserted into the central cake comes out clean. Cool for 5 minutes then transfer to a wire rack to cool completely. 4. For the frosting, bring the cream to a simmer. Put the chocolate into a small heatproof bowl then pour the hot cream over the chocolate and allow to melt. Stir until smooth, add the vanilla, then cool completely. In a large bowl, beat together the butter and icing sugar until pale, then beat in the chocolate cream. 5. 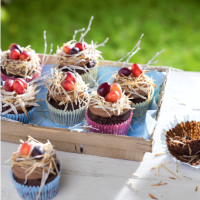 Spoon or pipe frosting nests onto each cake, scatter with coconut then fill the middles with grapes. Any leftovers can be kept in the fridge for up to 2 days – take out of the fridge 30 minutes before serving so the cakes can return to room temperature. Using a swivel-style peeler, cut pieces of fresh coconut into thin shavings. Spread out on a baking sheet and bake at 190°C, gas mark 5 for 5 minutes until golden at the edges. For a simpler (but less silky) chocolatey frosting for kids, cream together 175g each softened butter and sifted icing sugar then beat in 100g melted, cooled dark chocolate. Warning: Please slice the grapes into small pieces before serving to young children as grapes eaten whole can present a choking hazard. This recipe was first published in Wed Feb 24 12:36:00 GMT 2016.